Project based learning (PBL) is gaining renewed attention with the current focus on college and career readiness and the performance-based emphases of Common Core State Standards, but only high-quality versions can deliver the beneficial outcomes that schools want for their students. It’s not enough to just “do projects.” Today’s projects need to be rigorous, engaging, and in-depth, and they need to have student voice and choice built in. Such projects require careful planning and pedagogical skill. 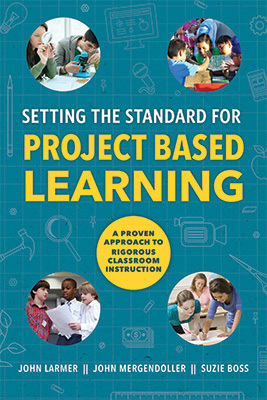 The authors—leaders at the respected Buck Institute for Education—take readers through the step-by-step process of how to create, implement, and assess PBL using a classroom-tested framework. Also included are chapters for school leaders on implementing PBL systemwide and the use of PBL in informal settings. new ways for educators to communicate with parents, communities, and the wider world. By successfully implementing PBL, teachers can not only help students meet standards but also greatly improve their instruction and make school a more meaningful place for learning. Both practical and inspirational, this book is an essential guide to creating classrooms and schools where students—and teachers—excel. JOHN LARMER is editor in chief at the Buck Institute for Education (BIE). He authored and/or edited BIE’s project based curriculum units for high school government and economics and was a contributing author of the Project Based Learning Handbook and is a writer and editor of BIE's PBL Toolkit Series. He codevelops professional development workshops and materials for teachers, including 21st-century skills rubrics and project exemplars. John presents at conferences and has consulted on PBL curriculum development for the National Academy Foundation, the Oracle Education Foundation, and Pearson Education. JOHN MERGENDOLLER joined the Buck Institute for Education in 1989 as its founding research director and was named executive director in 2000. An international advocate for project based learning, he has worked with educators throughout the United States and in China, Taiwan, Brazil, Greece, Romania, the United Kingdom, and many other countries to help them learn about and implement high quality PBL. SUZIE BOSS is a member of the Buck Institute for Education’s National Faculty. She is a writer and educational consultant who focuses on the power of teaching and learning to improve lives and transform communities. She is the author of several books on education and innovation, and her work has appeared in a wide range of publications including Educational Leadership,The New York Times, and Education Week. She is a regular contributor to Edutopia and the Stanford Social Innovation Review. She is a frequent conference presenter and consults internationally with schools interested in shifting from traditional instruction to technology-rich, project based learning.